This is just one line from a 10-page letter written by Dr Kafeel Khan on April 18, which The Wire has accessed. Khan has been in jail without a single bail-hearing in the high court. The sessions court rejected his bail once. In August 2017, 23 children had died overnight at Gorakhpur’s B.R.D. Medical College, all allegedly due to lack of oxygen. Khan was subsequently arrested on the charge of ‘attempt to murder’. Though Khan had been on leave that day, he began to gather oxygen cylinders from nearby hospitals and companies when he heard about the tragedy, in a desperate attempt to save other patients. Khan’s health is reportedly deteriorating. Shabistan Khan, his wife, has said that he suffers from heart disease. He was taken to a government hospital this week, to visit a cardiologist after complaining of palpitations. Through the 10-page letter, Khan describes the night of the tragedy, his efforts to save the children by sourcing oxygen cylinders from places outside the hospital, the poor conditions of the jail in which he is lodged, his inability to get bail and who he thinks is really responsible for the tragedy. “The moment I got that WhatsApp message on that fateful August 10, 2017 night, I did everything a doctor, a father, a responsible CITIZEN OF INDIA would/should do. I tried to save each and every life that was in danger due to sudden stoppage of liquid oxygen,” he writes (the text has been lightly edited for clarity). Khan is a paediatrician and had been on leave on the day of the tragedy. He is among the nine accused of the deaths. The owners of the oxygen-supplying agency, who had withdrawn the gas’s supply to the hospital over non-payment of dues, had been granted bail. But Khan, the principal of the college, the principal’s wife, another doctor and a few hospital administrative staff have not been granted bail. The principal and the other doctor were travelling outside Uttar Pradesh during this episode. In November, the police investigation dropped the charges of corruption and running a private practice against Khan. He says he called the concerned authorities that day in August and informed them of the situation; these authorities include the head of department, the principal and acting principal of B.R.D., the district magistrate of Gorakhpur, the chief medical superintendent of Gorakhpur and B.R.D. Medical College, and his other colleagues. He also called local oxygen supplier agencies and “begged” them to immediately arrange for oxygen cylinders at BRD, and called nearby hospitals. Khan’s letter describes the two days of chaos as he tried to restore the oxygen supply. He was able to scrape 250 cylinders together, paying for them himself and promising the suppliers that he would arrange for the rest of the payment soon. He was able to transport some of them in his car. He approached the deputy inspector general of police, whose response according to Khan was “quick and supporting”, and arranged for a truck and manpower from the Armed Border Force (a.k.a. Sashastra Seema Bal, SSB) to deliver the others. Their combined efforts meant the oxygen supply was restored around 1:30 am on August 13, three days after Khan had received the WhatsApp message that set him in motion. However, to this day, the Uttar Pradesh government has maintained that the oxygen shortage is not why the children died, that they died instead of natural causes. This contradicts the jail terms being served by Kafeel Khan and others. “They worked for 48 hours continuously. Their spirit boosts ours. I salute SSB and am thankful for their help. 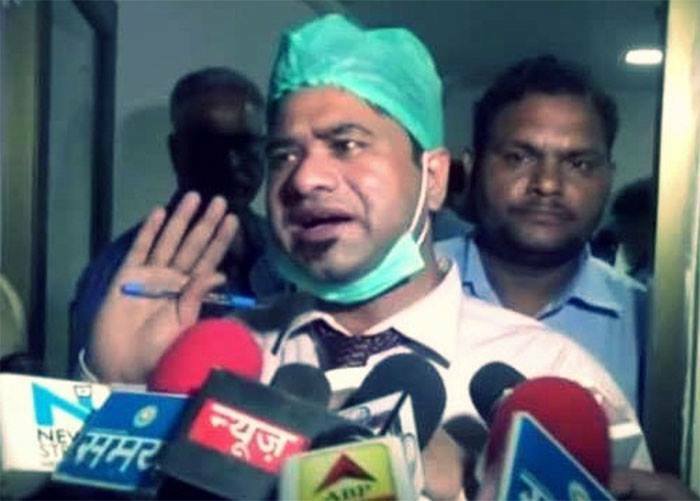 JAI HIND,” he wore about the efforts of his fellow doctors and the team put together by the police. Khan’s letter then describes his interaction with the state’s Chief Minister Yogi Adityanath on August 13, when the latter visited B.R.D. Medical College, an interaction that he writes turned his life “upside down”. He says he was not involved in the purchase, tender, order, maintenance, supply or payment of liquid oxygen cylinders at the hospital. Instead, he points the finger at Uttar Pradesh government officials: the district magistrate, the director general of medical education and the principal secretary of health and education. According to Khan, they had failed to act on the 14 reminders sent by the gas agency, Pushpa Sales, about the unpaid due of Rs 68 lakh. Note: This article originally stated that Khan had been in jail without a bail-hearing since August 2017. He was once granted a hearing in a sessions court. The mistake was corrected on April 23, 2018.